The full readings for today can be found here. You know, every now and then, my friend Father Chris calls me and asks me if I’d like to come down here and be with you good people and preach. And without fail, before looking at the readings, I always say “yes,” because I love him, and love my godchildren and love you all. And then, a week or so later, I go look at the readings, and I see that my friend, my priest, my brother has invited me to preach about Jesus tearing families apart, and bringing trouble between children and their parents. And I scratch my head and wonder at the nature of my friendship with Father Chris. But here we are, and this is the Gospel we have, and so we might as well get on with it. So, it’s worth putting this passage in context. In the 9th chapter of Matthew’s Gospel, Jesus has been doing that Jesus stuff. He has healed the woman with the blood disorder, healed two blind men and a mute with a demon, and raised a girl from the dead. And now, in chapter 10, he’s sending his disciples out to do that very same work: to cast out unclean spirits and cure every disease and sickness. That gets us to today’s Gospel. Before he sends the disciples out, he warns them: this isn’t going to be easy. There’s going to be trouble. He tells them, if they called me the devil, they’re not going to treat you any better. Those who follow Jesus can expect that sometimes they’ll be met with fear and smugness and slander. One of the things Jesus is doing is inviting the disciples to face their fears. Jesus was sending the disciples out, alone. Traveling in the ancient world was a risky business, and most people didn’t venture far away from their homes or their families. But Jesus sent them out, without any money, without even a staff. He sent them out like sheep among the wolves, so they would learn to trust God and trust each other. Fear is, somehow or other, the archen­emy itself. It crouches in people’s hearts. It hollows out their insides, until their resistance and strength are spent and they suddenly break down. Fear secretly gnaws and eats away at all the ties that bind a person to God and to others, and when in a time of need that person reaches for those ties and clings to them, they break and the individual sinks back into himself or herself, helpless and despairing, while hell rejoices. Now fear leers that person in the face, saying: Here we are all by our­selves, you and I, now I’m showing you my true face. And anyone who has seen naked fear revealed, who has been its victim in terrifying loneliness— fear of an important decision; fear of a heavy stroke of fate, losing one’s job, an illness; fear of a vice that one can no longer resist, to which one is enslaved; fear of disgrace; fear of another person; fear of dying—that per­son knows that fear is only one of the faces of evil itself, one form by which the world, at enmity with God, grasps for someone. Nothing can make a human being so conscious of the reality of powers opposed to God in our lives as this loneliness, this helplessness, this fog spreading over everything, this sense that there is no way out, and this raving impulse to get oneself out of this hell of hopelessness. Jesus calls upon the disciples, and by that I mean us, to confront every fear that stands between God and us. Jesus warns his disciples that there’s going to be trouble, not peace, but a sword. He says that families will be set against each other. In the Old Testament, there were a number of false prophets who went around proclaiming “peace” and good times when that’s not at all what was happening. Jesus distances himself from those false prophets because he knows this isn’t going to be easy for the disciples, nor is following Jesus easy for us. There’s going to be trouble. And Jesus talks about families turning against each other, and we know that did happen in the early Christian communities. Persecution of Christians and their families was common and still is in many places in the world. And that’s because, there’s going to be trouble. I sometimes hear people say that bad news, or trouble, comes in threes. That’s not been my experience in my Christian walk: it comes in something closer to three hundred and thirty threes. Whether it’s broken families, illness, losing loved ones, or the God-awful ways that we’ve begun to speak to each other politically, we find ourselves sinking in the mire. And there’s going to be trouble. Jesus tells his disciples, tells us, that if we want to be worthy of calling ourselves disciples, we need to pick up our cross and follow Jesus. Now, picking up our cross doesn’t just mean that we bear troubles. It means that, like Jesus, we bear them in love, without letting our hearts become hardened, we bear them in forgiveness. It means that, when troubles come, we turn to God, we lean on God and we know that God is with us. Then, we will walk as children of light; then we will follow Jesus. This is our proclamation as Christians. The great battle cry of the Gospels, of our faith and of the Church is the renunciation of the power of fear in our lives. We don’t have to be afraid anymore. And since we just celebrated the feast of Pentecost a couple weeks ago, it’s at least worth considering the possibility that our troubles may be one of the gifts of the Holy Spirit. You see, our troubles can force us to abandon the illusion of our independence, and turn to each other for help and comfort. Our troubles can pull us out of our unreflective everydayness, and compel us to examine the things in life that really matter. Our troubles can turn us from a mean-spirited self-devotion to lives of compassion, lived in community and lived in the presence of the God who never abandons us, no matter how often we abandon God. But here’s the linchpin of today’s reading, and the linchpin of our faith: we don’t have to go through our troubles alone. Jesus tells his disciples: look, sparrows are worth half a penny, but God watches every one of them when they fall. You don’t think God is watching over you? So, yes, there is going to be trouble, but you don’t have to be afraid. If we’re on Jesus’ side, God is on our side: the God of Abraham and Isaac and Jacob, the God who made all things, the God who makes all things new, the God who knows every single one of the hairs on our head. So, while we are going to walk through that dark land, Jesus reminds us that we aren’t going there alone. Amen. Surely the Lord is in this place, and I did not know it. Well good evening, good evening. It’s a great pleasure to be with you here at St. Stephen’s, and I want to thank you for your warm hospitality and your rector for the invitation to preach, especially on Michaelmas, the feast of St. Michael and all angels. You know, I love the story of Jacob. I love it for a lot of reasons, including that I’m his namesake and I’m so much like that rascal. I mean, he swindles his brother out of his birthright for a bowl of stew, and then he lies and cheats his way into his father’s blessing. And when he brother figures out what’s happened to him, he does the only thing he can do: he skeedaddles out of there and goes to a foreign land. And we find these stories time and again. Moses was a murderer with a speech impediment; Rahab was a prostitute; King David was an adulterer and a terrible father; St. Paul was a harsh, judgmental and cruel man who tortured and probably killed the early Christians. And Jacob, well, he’s a certified mess. These men and women were frail and broken and troubled—you know, like you and me. Funny things happen in unexpected places. God is born in a cow barn. God speaks from a burning bush. On the road to Damascus, the Church’s greatest enemy becomes its greatest advocate. And here in this wilderness, in this nowhere, this scoundrel Jacob has a dream. Dreams are funny things: they occur outside the boundaries of time and place. But in that “unplace” Jacob the refugee dreams of heaven and earth. And God, the God of his forefather Abraham, comes looking for Jacob in that dream. Jacob sees the angels, God’s messengers, as they travel up and down that ladder between heaven and earth. This is Jacob’s dream: a constant traffic between this life and the divine life. And in this place of limbo, where Jacob is cutoff from both his past and his future, in this wilderness, it is YHWH who speaks to Jacob. Scripture tells us., And the Lord stood beside him and said, “I am the Lord, the God of Abraham your father and the God of Isaac; the land on which you lie I will give to you and to your offspring; and your offspring shall be like the dust of the earth, and you shall spread abroad to the west and to the east and to the north and to the south; and all the families of the earth shall be blessed in you and in your offspring. Know that I am with you and will keep you wherever you go, and will bring you back to this land; for I will not leave you until I have done what I have promised you.” So, the Lord does three things there: the Living God traces his presence back through Jacob’s family tree, promises Jacob the land and God’s blessing, and assures this rascal of the divine presence in his life. And when he wakes up, Jacob announces one of the most profound statements in the whole of Scripture: “Surely the Lord was in this place— and I did not know it.” It is a remarkable observation, but I think Jacob was only half-right. You see, the point of the story isn’t exactly that God was in Beer-sheba, or Haran, or Bethel, or Jerusalem. All those things are true, but the point of the story is that God was in Jacob, with Jacob. And he didn’t even know it. Now, if that were true of only Jacob, it would be an interesting biblical fact, but not especially important. But through the incarnation, through God becoming flesh and walking among us, and through our baptism and the bread and wine we take into our lives, God is with us, too. God is in us and with us, and like Jacob, most of the time we don’t even know it. In the late 1700s, there was a very famous rabbi named Levi Yitzchok, who lived in Berditchev (in the modern country of Ukraine). In trying to interpret this passage of Scripture, he wrote that the ladder represents all of humanity. Our feet are firmly planted on the earth, but we are forever reaching toward heaven, toward the divine. I like that idea. We are called to be instruments of the traffic between heaven and earth; we are called to be the conduit of the divine recreation, heralds of the incarnation, and called to make a pathway for messages to and from the God of Abraham, of Sarah, of Isaac and Rebecca, and the God of Jacob. Soon, our brother Wesley will make his vows as a Dominican novice. I can’t speak for him, but one of the startling things that took place as I began to live into those vows was the recognition that God was with me, that God was in this place, and I didn’t even know it. It is my prayer for him as he begins this new vocation that he have a vision of angels bearing messages to and from the Living God. And today, it’s my prayer for Father Wesley, and it’s my prayer for you and me as well, that we come to realize that God is in this place. Then one of the seraphs flew to me, holding a live coal that had been taken from the altar with a pair of tongs. The seraph touched my mouth with it and said: “Now that this has touched your lips, your guilt has departed and your sin is blotted out.” Then I heard the voice of the Lord saying, “Whom shall I send, and who will go for us?” And I said, “Here am I; send me!” Isaiah 6:1-8. In today’s reading from the Lectionary, Isaiah describes the vision in which he received the call to his vocation as a prophet. He locates this mystical moment at a very specific time, “the year that King Uzziah died.” King Uzziah had enjoyed a long reign (783-742 B.C. ), during which Judah achieved the summit of its power. The economic, agricultural, and military resources of the country increased substantially during his rule. Like a Greek tragedy, however, Uzziah’s strength emerged as his great weakness. He usurped the power of the priesthood, ultimately leading to an outbreak of leprosy on his forehead which precluded him from entering the Temple. II Chron 26:18-21. Isaiah has the remarkable experience of actually seeing the Lord (“Adonai”) in this vision. Surrounding Adonai are seraphs who cry to each other, “Holy, holy, holy is the Lord of hosts, the whole earth is full of his glory.” The threefold repetition of the Lord’s holiness should resonate with us particularly on Trinity Sunday. Like a number of Christian mystics, Isaiah’s initial response to this intense and personal encounter with the Almighty is one of profound humility, even inadequacy. He says: “I am a man of unclean lips, and I live among a people of unclean lips….” Overcome with a feeling of acute inadequacy, Isaiah expresses profound awe at this vision. 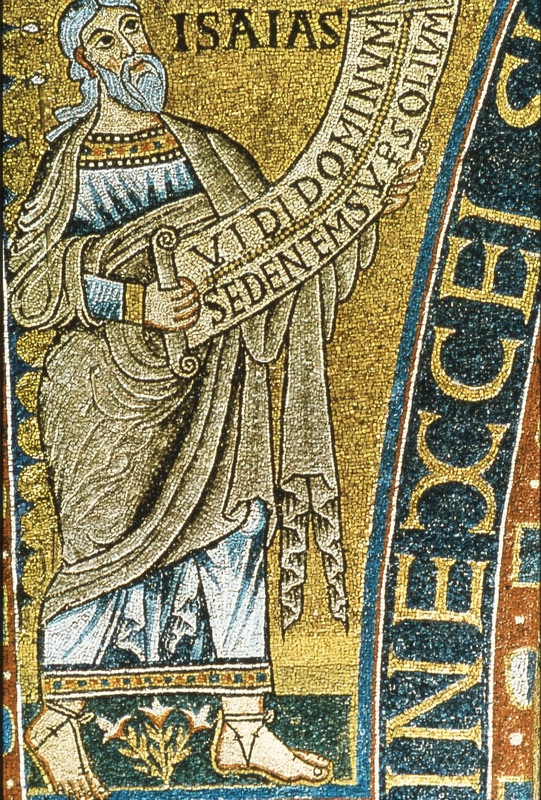 Rather than offering a word of consolation, one of the seraphs touches his lips with a burning coal, burning away his sin and freeing him to speak God’s word. As a priest explained to me when I was a young boy, within this passage the seer is seared. I think for many of us this rings true: our vocation does not always arise from a remarkably joyous event, nor does it occur without some pain. And yet, somehow this burning moment will both heal and enable Isaiah to become God’s voice. Having been thus cleansed and healed, Isaiah can now hear God’s call and answer “Here I am; send me!” In a very rich sense, that vision will provide the touchstone upon which the balance of Isaiah’s life and ministry will depend. For many of us in liturgical churches, the cry of the seraphs (“Holy, holy, holy”, known as the sanctus) now serves as a part of our weekly worship. When we hear that wonderful hymn, I wonder if we also hear a call to our own vocation. I wonder if we can hear the Lord asking, “Whom shall I send?” and whether we will answer that question. Isaiah’s encounter with the Living God changed him forever. I pray that ours will, too. As Jesus passed along the Sea of Galilee, he saw Simon and his brother Andrew casting a net into the sea– for they were fishermen. And Jesus said to them, “Follow me and I will make you fish for people.” And immediately they left their nets and followed him. 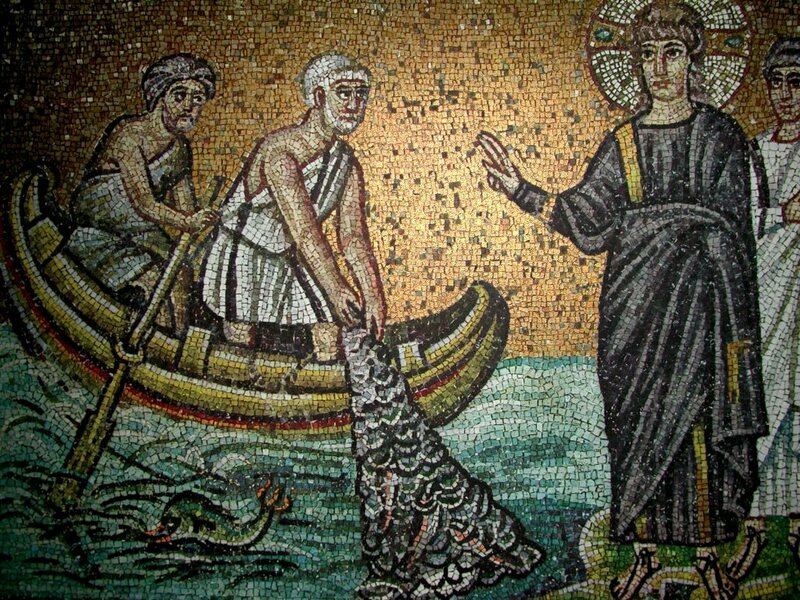 As he went a little farther, he saw James son of Zebedee and his brother John, who were in their boat mending the nets. Immediately he called them; and they left their father Zebedee in the boat with the hired men, and followed him. Mark 1:14-20. Mark’s Gospel offers us some unique insights into the Christian life for the third week of Epiphany. After John the Baptist’s arrest, Jesus announces the imminence of the kingdom of God, requiring repentance and calling for hope (belief “in the good news”). Mark sets the story on the sea of Galilee, known for sudden storms. The men who made eked out their living fishing on these waters worked very hard, were heavily taxed, and struggled with many of the same day-to-day issues we know so well. I’ve known men like this, and they are not easily moved. So, Jesus meets two sets of brothers: Simon and Andrew, and James and John (who Jesus later nicknamed the “Sons of Thunder”). He calls to them to follow him, and each of these men leave behind their work, their families and their homes to follow Jesus. As we discussed in the call of Samuel, God has a funny sense of timing, and his message often interrupts us when we’re trying to do something else. Perhaps these men were just ready to hear a message of hope and forgiveness. Perhaps they were ready to hear the message that evil doesn’t win and that there’s another way to live. I think, however, that this arresting story of the origins of the Church sheds a good deal of light on the kind of man Jesus must have been. He must have been a remarkably compelling figure, this itinerant preacher walking along the Galilee. Mark’s Gospel reports that the decision to follow Jesus occurred “immediately”, suggesting that their hopes for the promised good news overcame their fears and their attachments. The passage also suggests these men felt a sense of urgency, that they couldn’t put off their walk with God any longer or take care of a few little things beforehand. May it be so with us, too. The Gospel teaches us something important about our path to discipleship. Very few of us will start or travel down this path of conversion alone. Conversion, whether we’re turning away from or turning toward something, is a difficult process, and most of us will need to take a friend, a brother or a sister along for the journey. Jesus called these disciples into a vocation of hope and forgiveness and a relationship with the living God. These two sets of brothers felt impelled to leave behind their ordinary, workaday lives and follow Jesus. May it be so with us, too. Finally, Scripture teaches us an important lesson about being a disciple. Then and now, following Christ will require that you’re going to have to leave some things behind. In the case of these men, it was their boats, their nets, their jobs and their families. For some of us, it may be habits, outlooks, destructive relationships, or the fears that bind us to the present moment. The disciples found a way to leave those things behind. May it be so with us, too.